I sought explanation from the head granthi. He told me people from India and abroad sent money for akhand paths to be followed by Guru-ka-langar as thanksgiving or wish fulfillment. I could not comprehend how prayers recited by someone else could benefit a devotee who paid for them. There has been much debate in our community on whether paying a professional to do an Akhand Paath on one’s behalf is contradictory to Gurmat. I also remember years ago when the SGPC was “selling” Akhand Paaths on-line. Luckily, outrage from Sikhs all over the world stopped that practice. However, this article got me thinking about Akhand Paaths, and the role it currently plays in our community. I’ve seen various historical references to when and how Akhand Paaths began. 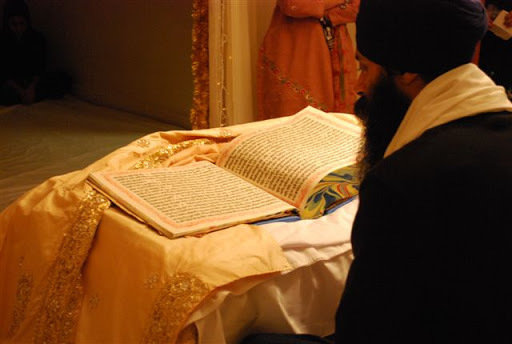 Some say it began during Guru Gobind Singh’s time, where he had five of his Sikhs read the entire Guru Granth Sahib to him, then subsequently did so to mark significant occasions. Others say the continuous reading became prevalent while Sikhs were in the jungles and on the move. I’m not sure of the authenticity of either, but the practice itself was acknowledged by the Panth and defined in the Rehat Maryada. There are many who debate that Akhand Paaths are simply an empty ritual and should be abolished. Most Akhand Paaths are done without anyone listening and have been minimized to a money-making transaction for Gurdwaras and Sikh institutions. While I understand and somewhat agree with this sentiment, I don’t know if I’m willing to throw out the idea altogether. Personally, I have fond memories of Akhand Paaths at my home as a child. It seemed like the right way to mark a special occasion, and shouldn’t we be encouraging “Guru-centered” activities any way (even with our imperfections in the way we do them)? Isn’t this better than lavish parties? Although there weren’t many listeners, I always loved going to our Guru Sahib da Kamra in the middle of the night to listen to Paath. And although I’ve only read for an Akhand Paath a few times, I enjoyed the opportunity to read Baani for an hour or two without interruption, even though my understanding was limited. It didn’t really matter to me that no one was listening. A few years ago, a handful of us (not really youth anymore) Sikh youths decided to do something different to mark one of our birthdays. Rather than our typical dinner outing, we decided to hold a Paath. Only difference was, it would be a Sehaj Paath (Sadharan Paath), or a complete but non-continuous reading of the Guru Granth Sahib. It was structured similar to an Akhand Paath in that we did follow a schedule with assigned times, but it was over a 3 week period, mostly during nights and weekends to allow for maximum sangat. We even marked on the calendar when we would be reciting certain parts of the Guru Granth Sahib that may invoke larger discussion like Sidh Gosht, Babur Baani, Asa Ki Vaar, etc. We chose one house to do the Paath in, and all took turns making meals to share the work. It was an amazing experience and we all seemed to take something different from it. Some of the novices used the Paath as a way to improve their reading and fluency and with Sangat around following along with pothis, there was time to correct readers on their pronunciation, and re-read lines. Some of the more experienced readers paused every so often to ask for a translation of a line or a Shabad, which would often lead to discussion, and sometimes debate. As we all gathered for the conclusion of our Paath, it was unlike any other Paath da Bhog I have attended. It took on a different meaning for me. The happiness I felt had less to do with finishing on time…but more so because I had learned something. At the end of the day, I don’t feel Akhand Paaths should be abolished or anyone should be discouraged from reading Baani, continuously or not – but, I do hope our generation does organize, participate in, and encourage more Sehaj Paaths. I believe this will be more educational and experiential for all involved. And following the “State of the Panth” through camps and several different blogs for some time…it seems like such individual and community reflection is needed now more than ever. In Sikhi, we have powerful and beautiful traditions, I hope the inquisitive nature of our generation will force us to bring more meaning back to such traditions, rather than just empty ritual…which is what I believe, Guru Sahib had intended. This entry was posted on Friday, June 12th, 2009 at 3:50 am	and posted in Uncategorized. You can follow any responses to this entry through the RSS 2.0 feed. Awesome! – I've often felt conflicted about Akhand Paaths myself – Sehaj Paaths seems like the perfect solution.